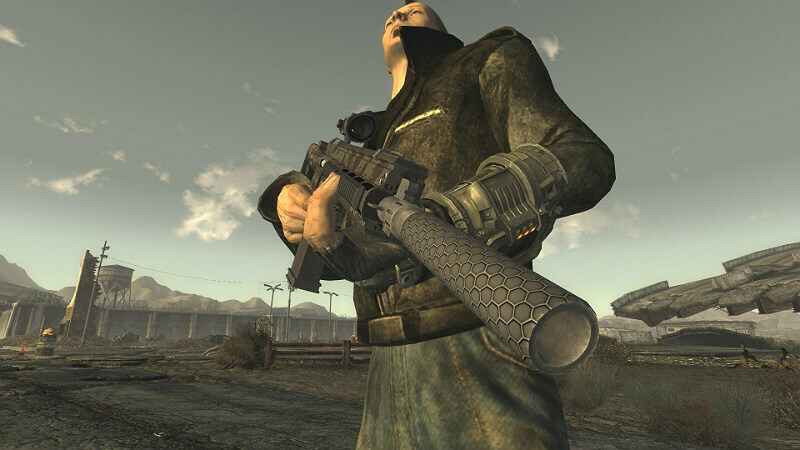 This guide contains the locations of all unique weapons in Fallout New Vegas. This guide does not include the locations of unique weapons added by DLC. This guide may include some minor quest spoilers. Found inside the Bison Steve Hotel in Primm. It’s in the locked safe in the gift shop. Lockpick 75 will be required to open the safe. Carried by Benny. 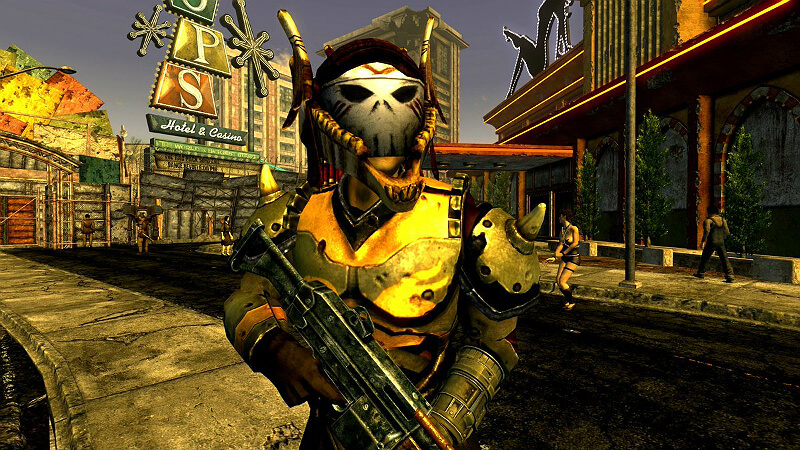 Benny can be found inside The Tops in the New Vegas Strip during the quest “Ring-a-Ding-Ding!” or in The Fort during “Render Unto Caesar”. You will need to loot the gun. Carried by The Lonesome Drifter. 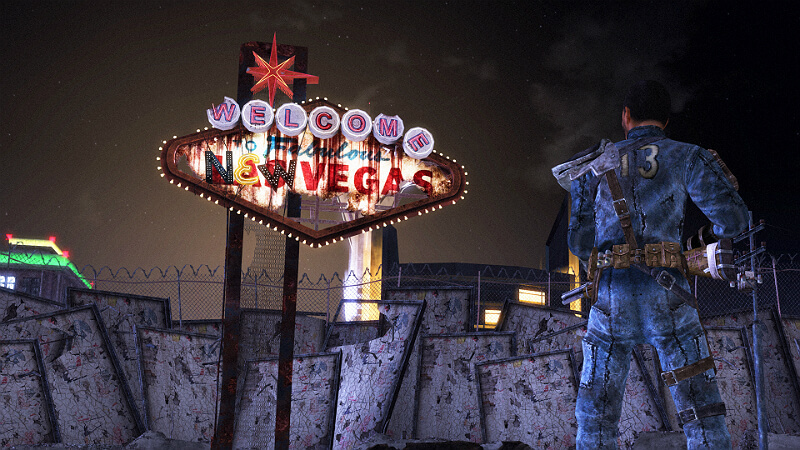 The Lonesome Drifter can be found sitting under a billboard just north of El Dorado Gas & Service if the quest “Talent Pool” is not completed, or in The Aces theater at The Tops on the New Vegas Strip after the quest “Talent Pool” has been completed. You can be given the gun by passing a Barter 50 check during the quest “Talent Pool”. You can also loot the weapon. Found in the Dino Bite Gift Shop in Novac. It’s on a shelf in the locked storage room. The key for the storage room can be pickpocketed or purchased from Cliff Briscoe during the quest “Come Fly With Me”. You can also buy the gun directly from Cliff Briscoe. Found in Wins Hideout near Westside. It is inside a locked safe. Lockpick 100 can be used to open the safe. You can also obtain the safe combination from Sammy Wins using Speech 55. Carried by Old Lady Gibson. Old Lady Gibson can be found in living in the hut in the Gibson Scrap Yard. You will need to loot the weapon. Reward for the quest “Bleed Me Dry”. The quest is initiate by Red Lucy in The Thorn. Found inside Fields’ Shack. If you took the Wild Wasteland trait, instead of being located inside Fields’ Shack it will be located inside a well outside of Field’s Shack. This well will only appear after asking Rex if Jimmy fell down a well during a random event. Found inside the Vault 34 Armory in Vault 34. Found in a locked chest at Sniper’s Nest. Lockpick 100 will be required to open the chest. Carried by Corporal Sterling. 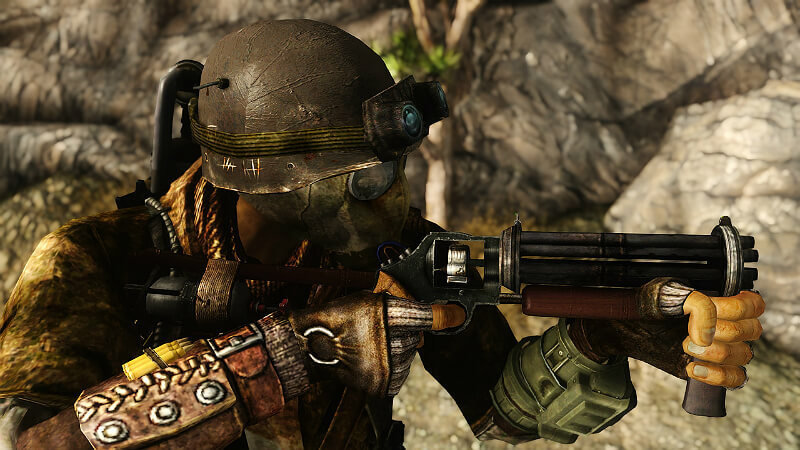 Corporal Sterling can be found in Camp McCarran if the quest “Three-Card Bounty” is not completed, or in Camp Forlorn Hope after the quest “Three-Card Bounty” has been completed. You will need to loot the weapon. Found inside the Broc Flower Cave. The weapon is located in the small lab overlooking the cave chambers. The cave is populated by giant rats. Reward for the unmarked quest “Dealing with Contreras”. 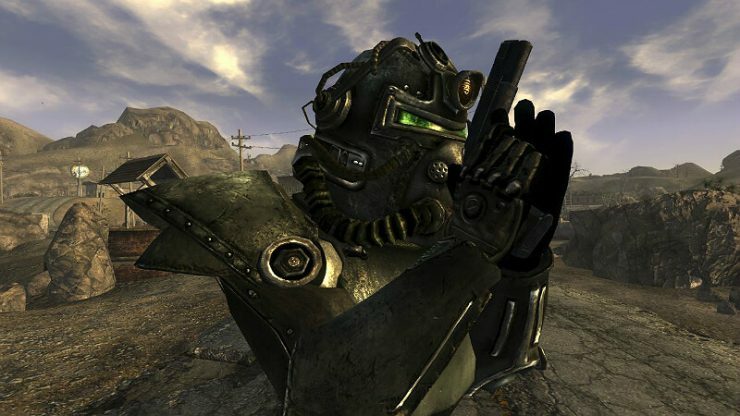 The quest can be initiated by either Contreras or Lt. Carrie Boyd in Camp McCarran. You will have to side with either Contreras or Lt. Carrie Boyd during the quest to receive the weapon. Siding with Keller will not give you the weapon. Found at The Devil’s Throat. It’s inside the blue truck at the bottom of The Devil’s Throat. The weapon is guarded by centaurs. Carried by an alien captain. The alien captain can be found north of Horowitz Farmstead. You will need to loot the weapon. Can only be found with the Wild Wasteland trait. Purchased from Max. Max can be found playing in Freeside. In order to activate the weapon, you will need to configure the power grid to divert power to the ARCHIMEDES II during the quest “That Lucky Old Sun”. The quest is initiated by Fantastic inside HELIOS One. Looted from the corpse of Allen Marks. The corpse of Allen Marks can be found inside the reward room of the Sunset Sarsaparilla Headquarters after presenting 50 Sunset Sarsaparilla Star Bottle Caps to Festus for the quest The Legend of the Star. Found in a locked chest inside the Vault 34 Armory in Vault 34. Lockpick 100 can be used to open the chest, or Col. Blackwell’s Key can be used if it was taken from Pearl’s Barracks at Nellis Air Force Base. Found near the Common Area on the fifth floor of Vault 22. You will need to lockpick a door to access the weapon. The Lockpick skill required to lockpick the door varies with player level. Found in storeroom in REPCONN Headquarters. Either Lockpick 100 or Science 100 will be needed to unlock the storeroom door. The storeroom door can also be unlocked using a keycard found in a suitcase on the third floor of REPCONN Headquarters. Carried by a mercenary. The mercenary can be found north of Horowitz Farmstead. You will need to loot the weapon. Cannot be found with the Wild Wasteland trait. Found at the Crashed Vertibird. The weapon is guarded by hardened sentry bots and hardened mister gutsies. Carried by a nightkin sniper. 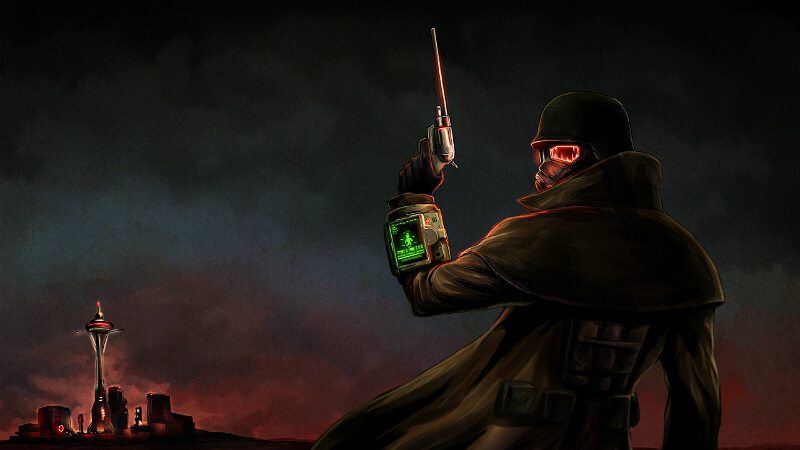 The nightkin sniper can be found keeping watch at the radio tower in Black Mountain. You will need to loot the weapon. Found inside Dead Wind Cavern. 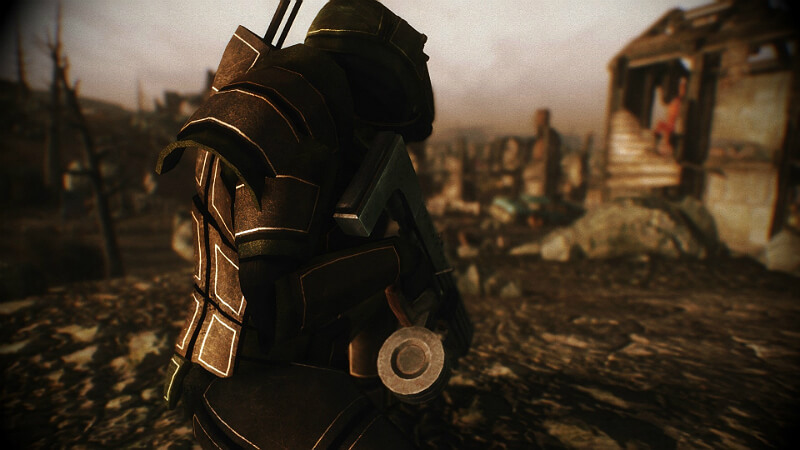 The weapon is guarded by deathclaws. Inside the generator building at Nellis Array. It’s lying next to a skeleton at the bottom level. The weapon is guarded by exploding giant ants. Found in the Searchlight Church Basement of Camp Searchlight. The weapon is guarded by golden geckos. Can only be found with the Wild Wasteland trait. Found in Chance’s grave near the Tribal Village. A shovel will be needed to rob the grave and loot the weapon. Cazadores frequent the area around the grave. Found in the Wolfhorn Farmhouse in the Wolfhorn Ranch. It’s on top of the stove. Carried by Sergio. Sergio can be found in The King’s School of Impression in Freeside. You will need to loot the weapon. Reward for the quest “We Are Legion”. The quest is initiated by Dead Sea in Camp Nelson. Alternatively, you can loot the weapon off of Dead Sea during the quest “Restoring Hope”. Found in the Sealed Sewer. To access the Sealed Sewer you will need to loot the Luke’s Find key from either “Blind” Luke or “Sweet” Jill. The corpse of “Blind” Luke can be found in the Central Sewers. The corpse of “Sweet” Jill can be found in the East Central Sewers. The weapon is guarded by feral ghouls. Carried by Legate Lanius. Legate Lanius can be found in Legate’s Camp during the quests “No Gods, No Masters”, “All or Nothing”, or “Eureka!”. You will need to loot the weapon. Found in the Searchlight Fire Station at Camp Searchlight. It’s in a bathroom stall. To unlock Camp Searchlight Fire Station you will need to either loot the key from Logan or be on the quest “Wheel of Fortune”, which is initiated by Logan. 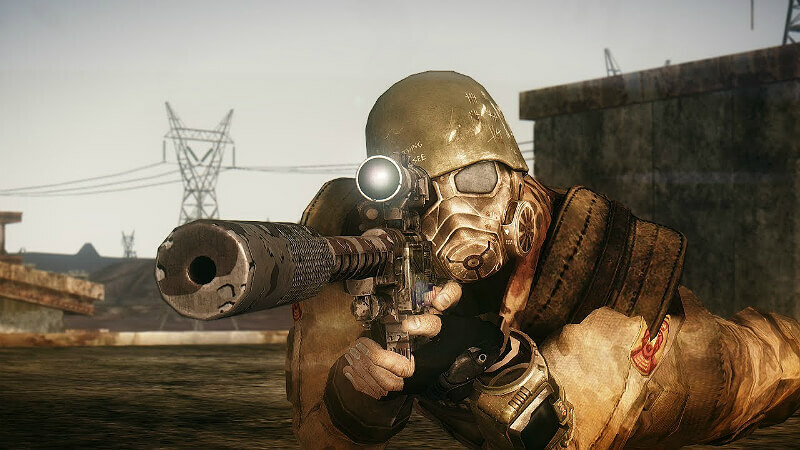 Logan can be found inside Searchlight NCR Storage in Camp Searchlight. Carried by Driver Nephi. Driver Nephi can be found near South Vegas Ruins East Entrance. You will need to loot the weapon. Found inside the Charleston Cave. It is next to the corpse of a nightkin. The weapon is guarded by night stalkers. Carried by Little Buster. 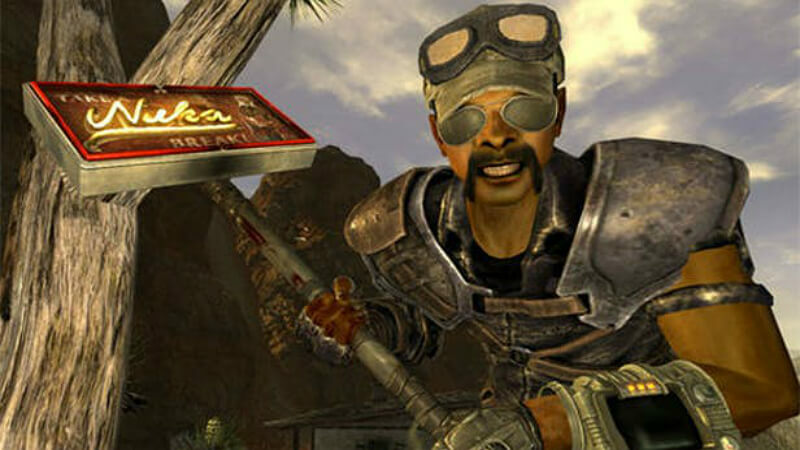 Little Buster can be found in Camp McCarran if the quest “Three-Card Bounty” is not completed, or his corpse can be found on some railroad tracks in Freeside a few days after the quest “Three-Card Bounty” has been completed. You will need to loot the weapon. Found on the Casino Floor of the Lucky 38 Casino in the New Vegas Strip. It’s sitting on a bookshelf. Carried by a Viper Gang Leader. 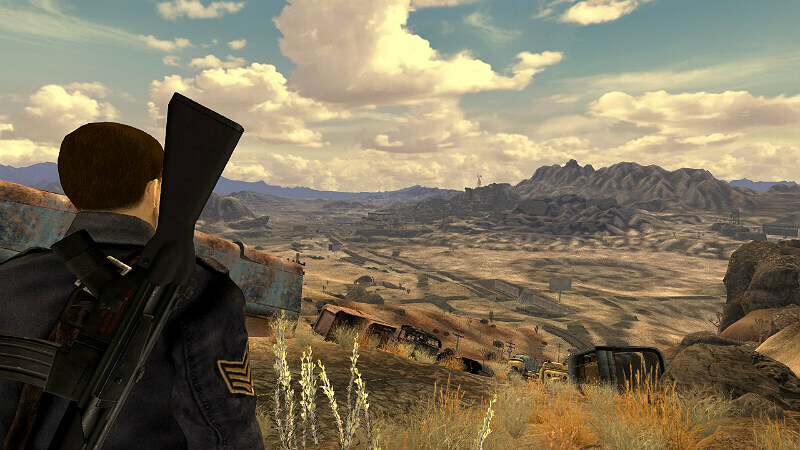 The Viper Gang Leader can be found in Bonnie Springs. You will need to loot the weapon. Looted from the corpse of a Prospector in Black Rock Cave. The corpse is guarded by nightkin. Looted from the corpse of a Jackal Gang Member in Ruby Hill Mine. The corpse of the Jackal Gang Member is near one of the entrances to the underground lake chamber. The weapon is guarded by lakelurks. Found in Aurelius of the Phoenix’s Office in Cottonwood Cove. It’s in Aurelius of the Phoenix’s desk.